Unlike other "do-it-yourself" retrofits, Kennedy Technology Group, uses fused, and sealed electromechanical components solidly mounted to a printed circuit board. Price for the retrofit kit, pn 95454 is USD35. Please note: This kit may not be compatible with radio part number 39110-MT8-7720; some have extra components installed that may not allow the Kennedy circuit board to mount properly. To be sure, open the radio and look at the mounting area as shown here. If you want to plug straight into the headset jack of an MP3 player, order part number 95370, Stereo harness. Other stereo harnesses are available here. Note: If the harness you select provides a power connection, order the Universal Power Harness, KTG part number 95299. If you are going to connect the retrofit to one of Kennedy's other interface assemblies (e.g. MC/GPS, AuxSwitchSet, Single AuxADSet, etc), order KTG Part 95449, Aux Audio extender. A switch is required to select either auxiliary audio or 1500 AM/FM audio. A wide selection is available. If you are going to connect the retrofit circuit to one of Kennedy's audio switching GPS interface modules (e.g. 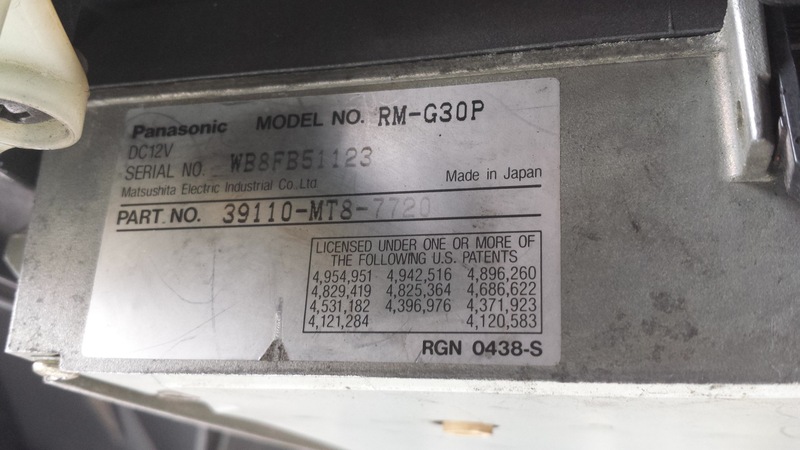 MC/GPS3), order part number 95450, 1500 retrofit to MC/GPS switch harness (USD20.00).